This past weekend, readers of The Daily Gazette had the opportunity to pose questions to Mountain Justice about the referendum on fossil fuel divestment. Those questions and another explanation of the referendum can be found here. Now, Mountain Justice is replying to these questions in order to give readers and voters more details on the referendum. Voting will occur today and tomorrow. 3 – 5pm on Tuesday (2/21): Dogs for Divestment: Come spend time with friendly dogs, eat homemade baked goods, and vote! Can you be more specific about what the differences are between the partial divestment you’re proposing and full divestment, as well as the extent to which you consulted people from the board and the administration to come up with the proposal? Full divestment would entail selling all of our investments in the 200 largest fossil fuel companies. This would mean asking our existing commingled managers to move our accounts to fossil free funds (they either would have them, or we would ask them to create these funds, which some of Yale’s managers did when they asked), or we would need to leave those managers and find others. 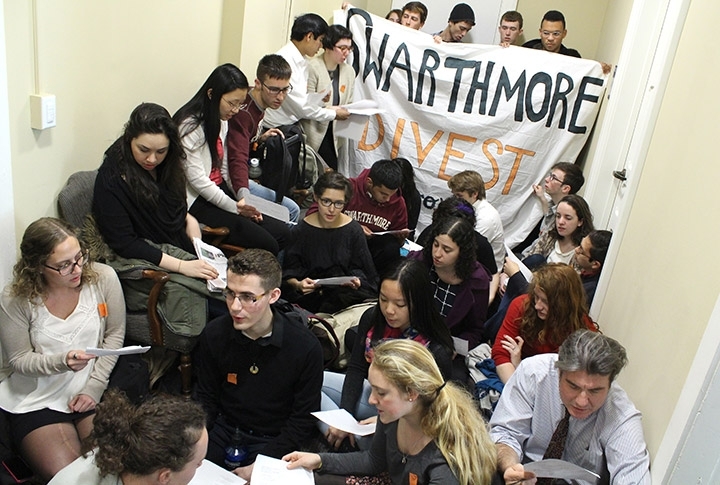 We think full divestment would be the most powerful action for Swarthmore to take and have argued that it is very feasible. Many other institutions have taken such action. However, the Board disagrees with us on the feasibility of full divestment, namely the challenges of changing our existing managers, which they say would be a logistical challenge. Thus, we have presented an alternative proposal that does not involve leaving any managers: we will only divest to the extent our current managers can accommodate fossil free investments. Though we’d prefer full divestment, in this political climate, we need moral leadership from institutions like Swarthmore and even partial divestment will send a powerful message: that we are removing our support from the industry that is supporting and profiting off the Trump administration’s deadly climate policies to the fullest extent to which there is consensus within our community that it is financially responsible. We developed this proposal through feedback given to us in multiple meetings with President Smith, Vice President of Finance Greg Brown, and Sustainability Director Aurora Winslade. They conveyed to us the Board’s concern with financial issues, like having to change investment managers, and we adapted our proposal accordingly to address these concerns. Will divestment have an immediate impact on the endowment, thus decreasing the school’s ability to provide students with the same/an adequate amount of financial aid? No. If there was an impact, it would likely be positive due to the underperformance of fossil fuel shares (see Guardian article on how the NY State Pension fund lost $5.3 billion from fossil fuel investments). There is an extensive track record of divestment decisions at schools and other institutions continuing to return equal or higher returns after divestment. The Board’s 2013 report arguing that divestment would pose risks for the endowment, which we respond to in depth here, does not apply to our current proposal. They were concerned that divestment would require us to change managers of our commingled funds, which are funds where our investments are pooled with many other investors. The proposal we are voting on would divest only to the extent that is possible while remaining with our current managers. We have over 70 managers, some of them offer fossil free investment options, others do not. To divest the latter, we might need to move managers; however, we only are asking the Board to divest the first category (funds held by managers that already have fossil free investment options). See our fact sheet for more information. I have heard nothing about this referendum until less than a week ago, and I am worried that because of the late notice, not very many students will vote in the referendum. Is there a minimum number of votes that must be cast for the referendum to be valid? Part of why the word got out later than we would have liked is because of the SGO process for referendums. It requires that the referendum begin within two weeks of the time the petitions are turned into SGO. We collected the necessary petition signatures (10% of the student body) very quickly and were in conversations with SGO for over a week ironing out details of the dates and format. We did not want to advertise the referendum before SGO had confirmed the dates and format because we weren’t sure if we were going to need to re-initiate the process after spring break. Why the focus on divestment when the college is doing so much other work to be sustainable (like green buildings and becoming carbon neutral), especially when divesting could possibly affect the college’s ability to continue funding programs like current sustainable building projects or even financial aid? We see divestment and the College’s sustainability initiatives as complementary. We support efforts to make Swarthmore more sustainable, but the bottom line is that our campus makes up an insignificant portion of global emissions. Becoming carbon neutral is an important gesture, but in order to move towards a sustainable future, we need action that will create systemic change. Reducing the emissions of individuals and individual institutions is not going to create the shift we need towards a sustainable future. 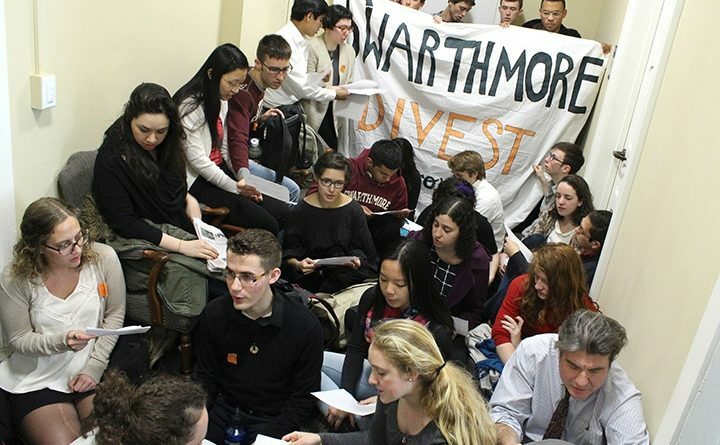 Instead, we must undermine the fossil fuel industry’s power, which they currently exert to lobby against renewable energy and progressive climate policies, actively hurting the types of sustainability initiatives Swarthmore promotes. Divestment is our most effective tool to do that. By divesting we can stigmatize the fossil fuel industry and reduce their corrupting power in our political system. This is heightened by Swarthmore’s unique position in the movement. We are the campus where this movement began, so our actions carry additional weight. As explained in more depth elsewhere in this article, we are on the same page as the Board — partial divestment would not risk hurting the college’s ability to fund further sustainability projects, financial aid, or any other programs. This isn’t an either/or situation. As Trump and his cabinet put forward devastating climate legislation, we need to do everything we can to stand for climate justice. The answer depends on the type of fund. For commingled funds, we are only asking portfolio managers to divest if those managers already have fossil free options. From meetings with the Finance and Investment Office, we know that some of our managers already have these options. For separately-managed funds, the fund is customized for Swarthmore. As Mr. Niemczewski (Chair of the Investments Committee) himself has said, with separately-managed accounts it is “easy for a client to come to the investment manager with specific needs or requests, such as for a fossil-free portfolio.” Again, we can divest those funds without changing managers. Lastly, schools that have already divested, including Yale, the University of Dayton, and University of Maryland have asked managers to offer fossil free options. Don Gould, Pitzer College’s Investments Chair (and himself an investment manager) says, “money managers are nothing if not adaptable to client demand, and are already offering funds free of fossil-fuel companies.” Read more on this here. Who are our investment managers and what kind of fossil free funds do they have? What are the returns on these funds? None of that information has been made public by the Board, but we can say that we have around 70 different managers. Since fossil free shares have consistently outperformed the market average, we see no reason why a fossil free fund would have lower returns than our current funds. The Board of Managers has offered no information to contradict our argument on this point. If you lose, will you honor the result and stop the campaign? Or do you only intend to force the other side to abide by a positive result? If a majority of the student body votes no on the referendum, yes, we will honor the result and end the campaign. Given the failure of the last referendum, why do you think this one will go any better? There was no previous referendum on divestment. Has the board said anything to you about whether they’ll take the results of the referendum seriously? No; however, we hope that they will take the results seriously. An SGO referendum is the most concrete way for students to make their voices heard in administrative decision-making and we hope they will take seriously this request. Direct democracy is a good way to make some decisions, but there are other decisions which the average voter is not competent to make. Why do you think that the average Swarthmore student is the best judge of where the college ought and ought not to invest its endowment? I, for one, know very little about the financial ramifications of divestment and even less about the effects divestment would have on the fossil fuel industry and climate change as a whole. Do you truly believe that the average student is qualified to make this decision? In general, we trust Swarthmore students to make this complex political decision. That is especially true for this decision because we actually believe that divestment is a simpler decision than the other political decisions we will have to make throughout our lives. We have presented a clear proposal that does not present any financial risk to the college and offers us a way to take powerful moral leadership on climate and take a stand for our values as an institution. Referendums and direct democracy are widely used practices for decision-making on a variety of complex political decisions. Last November, referendums passed in dozens of states affecting millions of people on important and complex issues ranging from the minimum wage to carbon taxes. Moreover, especially on climate, it is our generation that has the most at stake with this issue. We should have a say in this decision. Why is the voting threshold 30%? The voting policies are determined by SGO, not us.